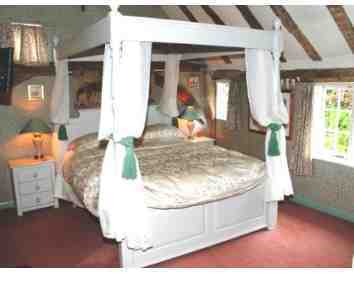 THE Oak Suite comprises a large beamed room with vaulted oak beamed ceiling and exposed kingposts. Both bedroom and en-suite bathroom are comfortably roomy. The bedroom is equipped with a very comfortable king-size four poster bed, bed-side cabinets with lamps and a built-in wardrobe. High quality bedding is standard. A built-in mini fridge is equipped with fresh milk. Tea, coffee kettle and biscuits are provided on a separate oak refreshments station. The Oak Suite overlooks the attractive walled garden at the rear of the house and is very quiet. Both bedroom and bathroom are centrally heated and an electric underblanket is fitted to warm the bed prior to occupancy! The en-suite large bathroom has a fixed shower above the bath, fed from a central power pump to provide a brisk shower. An attractive large handbasin is set into a roomy tiled vanityunit. 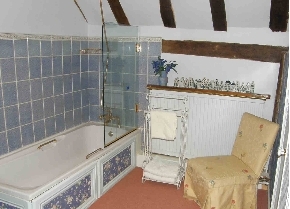 Fluffy towels, face flannels dressing gowns and top quality toiletries are provided.